6 On The Square ...is a volunteer-based community service organization committed to promoting music and the arts in central New York by offering cultural and educational programs. The venue has been recognized for its acoustics and the intimate performance setting. We plan to continue the tradition of the venue, and welcome more programs and activities for our community members. Visit us at www.6onthesquare.org for show dates and family style events. Educational Entertainment- the Oxford Memorial Library, aside from a wide assortment of books to borrow, the library has a wealth of programs, fun for all ages. Top rated performances by "real" historical figures like Knights in shining armor to amazing jugglers are offered (mostly free of charge)! There are afterschool book clubs for kids and lots more. The Oxford Community Band organizes each summer, starting with three rehearsals usually at the end of June/beginning of July in the Oxford High School band room. The final rehearsal is held after the first concert. For a complete schedule, contact Tom Rice, Treasurer, (home) 843-6083, (work) 334-1600, extension 5404. Or email: tomrice_ncs@yahoo.com. As always, visiting Oxford Band alumnae are encouraged to make themselves known to the group or bring an instrument and sit in. Audience members, bring a chair or a blanket to sit upon and relax. Don't miss this treat! 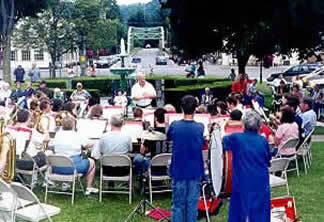 Performing as many as 8 concerts in all, the Community Band plays Thursday evenings, at 7:30/7:00 pm. The first four open-air concerts are held on the West side of LaFayette Park near the Bandstand at 7:30 p.m. Two more concerts are held in August at 7:00 pm; one is in Washington Park (across from the Bida Home), and the other is at the annual Ice Cream Social located at the Oxford Historical Society's Depot-Museum. While this usually ends the summer's last concert in Oxford, the band has had additional opportunities to perform. They have performed in mid-August at the Guilford Historical Society's Community Fun-Fest in Guilford, and then for the Smithville Flats Historical Society in Smithville. The group (of approximately thirty-five members, ranging in age from school students to senior citizens), play moderate grade marches, show tunes, overtures and novelty selections for the enjoyment of the Oxford community. There may be additional opportunities for performances, and a small stipend is paid for each concert and practice attended. Anyone who enjoys playing music and is interested in joining the band is welcome. It doesn't matter what town you're from, if you haven't played in ten years, or if you can't make all the concerts. The objective is to have fun making music with friends and to provide listeners with a pleasurable hour of music. Rehearsals are held at the High School Band Room. Voluntary help in setting up chairs, music stands and drums is always appreciated. Equipment is picked up at the High School, about half an hour before performance time. For further information: call Tom Rice, Treasurer, (home) 843-6083, (work) 334-1600, extension 5404. Or email: tomrice_ncs@yahoo.com. Youth Group events and a whole lot more. Please visit the Community page and read more about these groups and organizations individually. Also, keep an eye on the OxfordNY Events Calendar for upcoming event dates.